We are so very grateful that you are here to celebrate. You ARE a gift... and have been every day for the past 30 years. We thank God for giving you to us twice. Happy birthday to Katherine! Thirties are a fun decade. Enjoy! 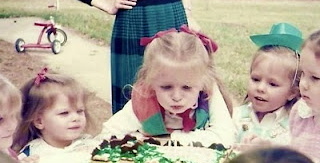 Happy 30th, Katherine! Mrs. Arnold, your post made me cry. I'm praising God for Katherine's life. i did not realize that she has the same birthday as my friend's sister Ashley, who died in a car accident on february 10, 2008. (i was going to her funeral when i got into my car accident the following day) today would have been her 23rd birthday. her mom also writes a blog (ashleymichellebond-peters.blogspot.com) and coincidentally your post about Katherine's birthday was right next to her post about Ashley's birthday on my blogger reading list. seeing the juxtaposition of two lives that have impacted me in such a drastic way was really humbling. especially considering i hardly knew Ashley and have only had a couple of interactions (outside of prayers) with Katherine. life is such a fragile thing. i know Katherine celebrates her birthday with a much deeper level of gratitude than she probably did before her stroke. i continue to pray for katherine, jay, james, and your whole family on a daily basis. have fun celebrating the miracle that is Katherine's life!! Why you no rave anymore?